Born in 1982, the Sinclair ZX-Spectrum can be considered a grown-up ZX-81. Carrying the versatile Z80 chip of the latter, this model has considerably more to offer though. The memory cells pack 48K, and video output is in colour. Sound is also there although the bleeps and blips sound pretty rough even next to earlier models like the Vic-20. Unfortunately, the confusing keyboard input was retained, but at least the keys were more than a flat membrane. Both the ZX-Spectrum and ZX-81 were the brainchild of (Sir) Clive Sinclair whose eccentric publicity stunts provided the computers with lots of exposure. 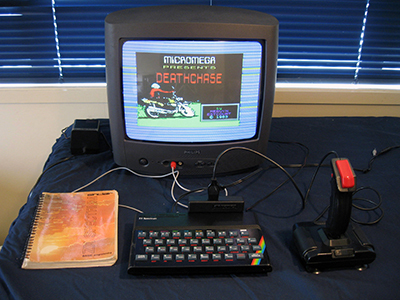 Like the ZX-81, the ZX-Spectrum was also cheap and the combination of inexpensive hardware and good publicity ensured it captured a large share of the home computer market in its native land, Britain. The major rival was the Commodore 64 and to a much lesser extent, the BBC Micro. In New Zealand they were around, and also gave the Commodore 64 a run for its money. I got this unit in early 2008 along with an expansion box which provides a joystick port, and another expansion box for microdrives. There is also two manuals and a mountain of tape software.